Another week, another feature story about Nubian Queen LoLa. What is it about this woman that keeps the media buzzing? Her humanitarian spirit as a newly-ordained minister of the Gospel? The sound of her voice emanating from the kitchen as she sings along with the blaring rhythms of Gospel Radio 1060 while fixing lunch? The tiny, crowded dining room, (you might as well call it a pulpit), where crisp hot chicken wings and seafood po’ boys come with a side of the Holy Scriptures? The backyard she has turned into a “solitary place” where the homeless find something fresh and warm to eat? Her one-time homeless status? Curiosity and my desire to share the pies I had leftover following last week’s Dream Pie Social lured me to Nubian Queen LoLa’s Cajun, Soul Food Kitchen in Austin. I went back for the inspiration. And, the wings. 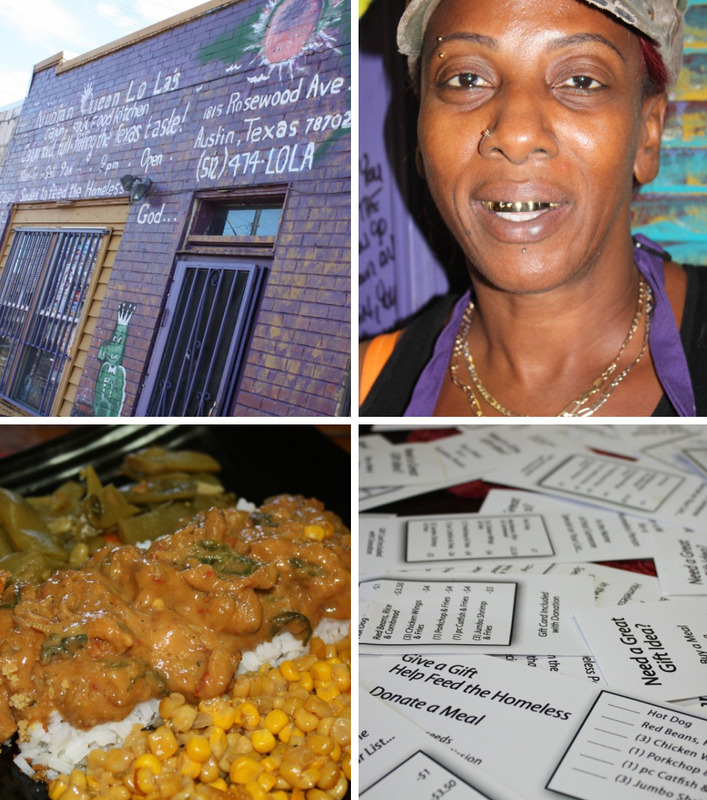 At LoLa’s kitchen table, a friend and I enjoyed a mixed menu of etouffee, collard greens, sweet tea, and life lessons that is seldom seen anymore — not in boisterous eateries, or at take-out counters, or in the rush of dinner served in front of American Idol. But there are two things to know if you decide to partake of LoLa’s: enjoy the wait, and expect to be encouraged toward greatness. LoLa is a one-woman show doing quadruple-duty as the restaurant’s greeter, cook, server, and dishwasher — a flour- and cornmeal-dusted representation of the cliche “labor of love”. As a child in Lake Charles, Louisiana, LoLa Stephens-Bell “sat on the sacks [rice sacks]” observing her mother craft Louisiana-styled dishes as a cook for Kozy Kitchen, Captain’s Table and the Candelight Inn. Eventually, when she was old enough she says, “I told her to sit on the sacks and I’ll do it.” LoLa promised her mother that one day she would have her own place where appetites and souls are nurtured at the same time. She also planned to hire “a little old lady” like her mom as a way to give back to the community. She was on her way to that dream when a flood turned her life upside down. LoLa became homeless. “I lost everything: my husband, my house, my kids,” she said. I think I understand what keeps everyone coming back to LoLa’s place. It is her generous spirit. LoLa reminded me of the ancestors who put dinner on the table in the 19th Century despite the harsh physical labor required, and who worked tirelessly for their neighbors, secretly feeding run away slaves to keep them safe for as long as they possibly could. Back then, routine daily tasks included soap- and candle-making, clothing families, cooking over a hearth, lifting heavy pots, toting water and, of course, tending children. Without refrigeration, cooks spent a great deal of their time fetching milk from the springhouse and keeping crockery storage jars clean. Cooking took place over a raging fire, which required cooks to spend long hours every day sifting ashes, adjusting dampers, lighting fires, and carrying wood. She maneuvered elaborate utensils that were suspended on hooks of various lengths on a backbar. This contraption allowed pots, kettles and footed Dutch ovens, also known as “spiders,” to hang at various distances above the flame. Did I mention that she did this in a long skirt with children running around? Some larger plantations had two cooks: a plantation cook and just for one for the children. Even so, the task of preparing a midday meal for up to 200 adults and more than 100 children reveals the Herculean strength required of a plantation cook. It is difficult for me today, with so many convenience foods, tools, and equipment, to imagine the physical demands of chopping wood for the kitchen fire, toting tremendous iron kettles weighing as much as 40 pounds, or to envision the enormity of turning spitted meat in a five-or-six-foot tall fireplace – by hand. And, it stretches my imagination to consider the skill it took to build that fire, measure its temperature, and calculate cooking time by the progression of the sun. But our women did these things, in much the way LoLa does today, with minimal equipment and scarce resources, but with a lot of hard work and devotion that produces food for the belly as well as the soul. So, my friend and I sit back and take it all in. We can’t help but wonder: Where have all the faithful servants gone? Do you know someone like LoLa who cooked and cared for her community as much as she did for her family? Please share her story by clicking on Comment below. it is very heartwarming to hear this story about LoLa, who is such an inspiration!!! thank you for writing about her and linking her life’s mission to the women who came before her, nourishing body and soul under difficult conditions. how refreshing to find someone who isn’t in the restaurant business for the fame, glory, or dare i say it? money! it comes to her because she deserves it, and that’s a very good thing. An inspiring snapshot of Queen LoLa as part of the historic continuum of spiritual women and practical cooking. The buzz continues just because LoLa’s good food and community committment resonate. Thank you Toni for another wonderful story and high lighting a rare example of true giving and caring. How inspiring. That’s what you call “love cookin'”. Not for the love of cooking, but for the love of those who need feeding of the body and spirit. Great story, Toni.